Design and finishes persuaded the judges to award Fairfield Central the Excellence in Design award in the sub-regional size category at the 2016 Retail Property of the Year Awards. 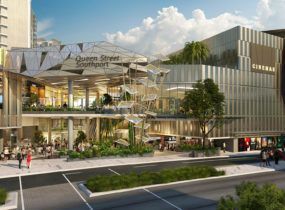 The centre’s simple clean mall layout and clear precincts ensure the underlying retail logic is sound allowing the centre to be easily adapted and extended in the future. 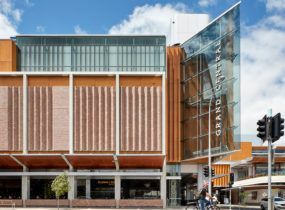 Generous malls and cascading natural light enhance exposure to tenancies and create a feeling of familiarity and dialogue with the original aesthetic. The new external dining space responds to the unique tropical conditions of North Queensland. It creates a comfortable and relaxing atmosphere.The expansion proudly acts as a buffer between the parkland residential estates and the major arterial highway. Earlier, our work on stage one included designing a sweeping entry statement, colourful super graphics and an external café integrated into the entrance. The lakes and canals of the adjoining Fairfield Waters estate provide the inspiration for the interiors and striking ‘ripple’ imagery of graphics. Good access from the existing major arterial roads to covered on-grade car parking set the standard for the amenity to its growing customer base.